Solid cast-brass antique bells with a smoothly polished surface in a soft golden color and a bright, clear "soprano" sound. 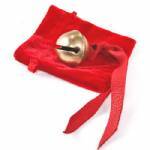 We handpick each of our antique gift bells, choosing bells primarily for exceptional sound and then for very good to excellent appearance. Even so, these choice bells may have slight visual flaws -- small casting defects, very short hairline cracks, scratches, etc. The bells will vary slightly in shape and size. If you order two or more of these bells, we will do our best to send bells that are similar in appearance and tone, but we cannot guarantee this.